I am opening this press release by saying I am Team Mariah. Star World is bringing the US’s top reality entertainment show, American Idol, once again to millions of viewers in Asia and beyond for the eighth year in a row. Star World is committed to delivering every exciting moment of American Idol Season 12 to scores of viewers in Southeast Asia, India, Taiwan and the Middle East so that they get the latest performances, updates and scoops straight from their homes as soon as they happen. Huge and fantastic changes are happening to American Idol in its 12th season, the biggest of which is a new roster of celebrity judges of unprecedented international stardom. Joining the powerful music producer Randy Jackson, who presence has fueled the show since its first season, are country music star Keith Urban, also husband to actress Nicole Kidman; the quirky and fun pop superstar Nicki Minaj, whose hits “Super Bass” and “Starships” have inundated global airwaves in recent years; and the eternal diva Mariah Carey, who has been enthralling audiences with her vocal prowess over a musical career that has spanned more than 20 years. Emmy-nominated host Ryan Seacrest is returning to the show to guide viewers through another exciting season of amazing musical performances. Expect some fireworks to happen on the show as egos clash and flare. One thing most Idol fans who’ve kept up-to-date with the pre-season activity of American Idol want to see most this year is how the purported feud between judges Mariah Carey and Nicki Minaj has played out. Even in the Philippines we already have Team Mariah and Team Minaj. Late in 2012, during preliminary auditions, it was reported that Carey and Minaj had a disagreement, with Minaj referring to the fight on her Twitter account. Both stars, however, are pleased to be part of the show, with Carey saying that she’s proud to be on a show that has produced massive stars and Minaj eager to be part of American Idol’s big family. Host Seacrest assures American Idol fans that there won’t be a dull moment between the two judges this season, and even if things between them may get intense, their presence together on the panel is something the show’s producers are excited about. Some new twists have been made to the audition process of America Idol Season 12. The first is the "American Idol Small Town Audition Bus Tour", which will bring the auditions to 10 small towns in America for those who can’t make it to the auditions in the big cities. Another type of audition is the “Nominate an Idol” program, where friends and family members can secretly nominate someone by filling up an online form and submitting an existing video of the person singing solo and a capella. A film crew will turn up on location to surprise the chosen nominee and give them a chance to advance to the next round. Online auditions were also held for the show in late 2012. With these new ways to get onto the show, American Idol fans can anticipate an even wider demographic of performers to be showcased—from the most talented singers in America to the weirdest wannabes who will do the craziest things just to get a crack at the title! American Idol is the biggest reality TV show, which set a record when it gathered 132 million votes for the Season 11 finale. There is so much going on this 12th season of American Idol, and Star World will bring it to viewers live and the soonest, with timely screenings and exclusive specials that add value to the viewing experience and satisfy the hearts of even the wildest, most die-hard fans of American Idol. 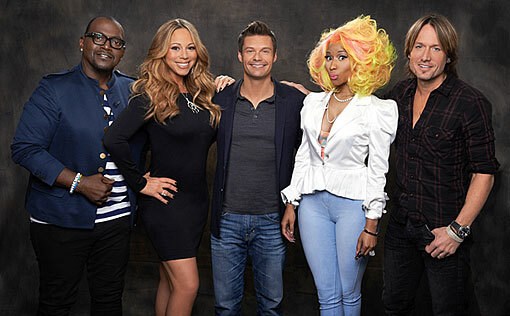 Season 12 of American Idol premieres this January 17, 2013 at 6PM with replays at 8PM and 11PM on Star World!